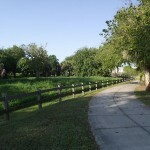 The southern turnabout along the western side of the intercoastal waterway at the Venetian Waterway Park Trail. 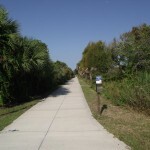 The path to Caspersen Beach at the Venetian Waterway Park Trail. 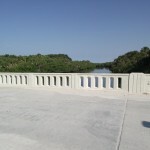 A viewing platform along the Venetian Waterway Park Trail. 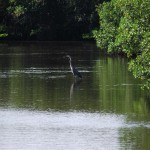 A blue heron wading as seen from the viewing platform along the Venetian Waterway Park Trail. 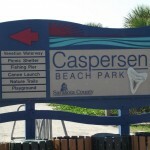 The Caspersen Beach Park sign along the Venetian Waterway Park Trail. 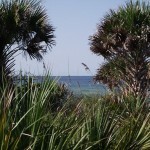 A view of the Gulf of Mexico as seem from the Venetian Waterway Park Trail. 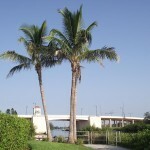 The Caspersen Beach Bridge at the Venetian Waterway Park Trail. 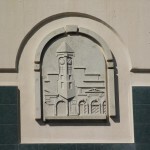 Venice Avenue Bridge Inlay along the Venetian Waterway Park Trail. 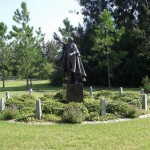 Statue along the Venetian Waterway Park Trail. 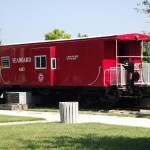 Boxcar along the Venetian Waterway Park Trail. 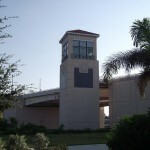 View of boarding platform for the Venice Train Depot at the Venetian Waterway Park Trail. 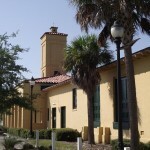 The Venice Train Depot at the Venetian Waterway Park Trail. 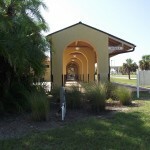 The Venice Train Depot Trailhead at the Venetian Waterway Park Trail. 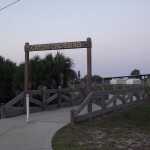 Catlin Crossings at the Venetian Waterway Park Trail. 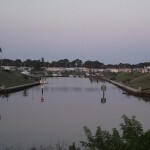 A yacht basin serving a subdivision along the Venetian Waterway Park Trail. 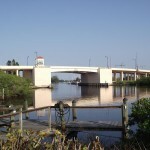 A distant view of the Venice Avenue Bridge as seen from the Venetian Waterway Park Trail. 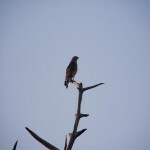 An osprey surveying its domain along the Venetian Waterway Park Trail. 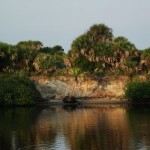 A bluff overlooking the intercoastal waterway as seem from the Venetian Waterway Park Trail. 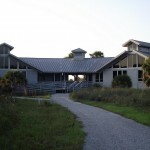 The Shamrock Nature Center in Shamrock Nature Center Park. 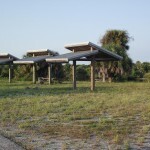 Pavilions in Shamrock Nature Center Park. 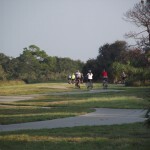 A group of cyclists heading out for a ride from Shamrock Nature Center Park. 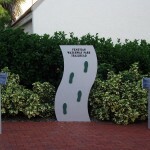 Southern most point along the east side of the intercoastal waterway along the Venetian Waterway Park Trail. 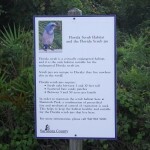 Florida Scrubjay Habitat Sign along Venetian Waterway Park Trail. 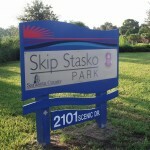 Skip Stasko Park Sign along the Venetian Waterway Park Trail. 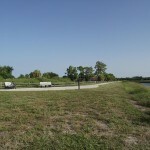 View of Skip Stasko Park as seen from the Venetian Waterway Park Trail. 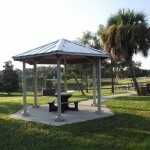 Gazebo at Skip Stasko Park along the Venetian Waterway Park Trail. 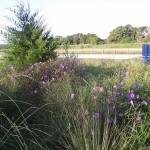 Wildflowers at Skip Stasko park along the Venetian Waterway Park Trail. 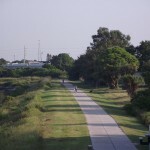 View of the Venetian Waterway Park Trail from the Circus Bridge. 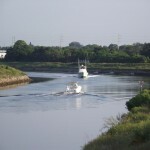 Turnabout along the western side of the intercoastal waterway. 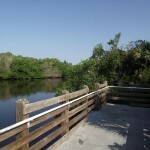 There isn’t a lot of shade along this trail so, if biking during the heat of the day, sunglasses and sunscreen should be used. 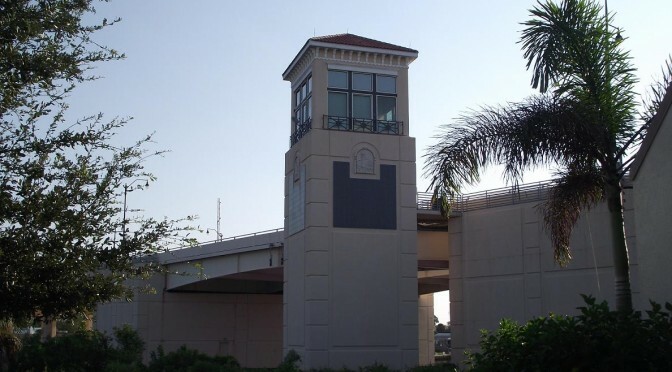 From either north or south on Interstate 75, take Exit 193, Jacaranda Boulevard south to Venice Avenue. 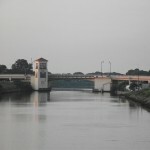 Head west on Venice Avenue and exit before the Venice Avenue Bridge. 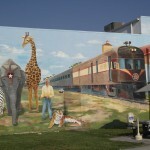 You will see the Venice Train Depot on your right. 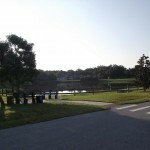 Park in any designated spot. 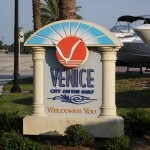 Alternatively, you can take U.S. Highway 41 either north of south to Venice and head west on Venice Avenue for a short distance. 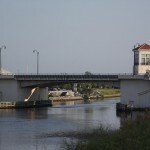 Exiting before the Venice Avenue Bridge. 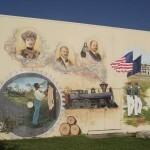 The trail length is approximately 22 miles more or less. 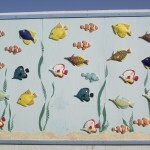 There are some side trips you can take that will extend the distance traveled. 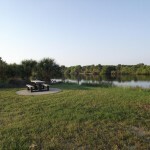 The trailbed itself is in fairly good shape. 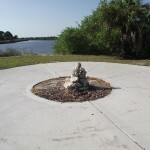 The trail is fairly level and flat. 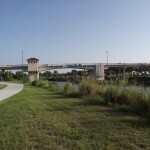 For those who do not like bridge crossings, simply riding along the east side of the trail can be sufficient if you add in the Legacy Trail (which is the northern end of the trail just north of the Venice Train Depot). 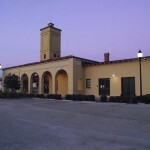 There are facilities at the Venice Train Depot trailhead. 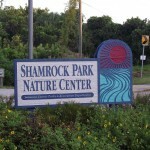 Facilities can be found at the Shamrock Nature Center. 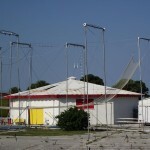 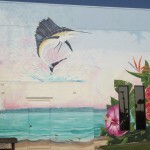 There are facilities at Caspersen Beach Park. 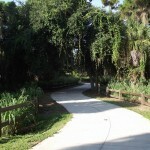 Other than the lack of shade, there are really no cons along this trail. 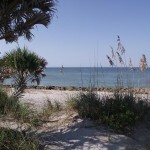 Caspersen Beach Park along the Gulf of Mexico. 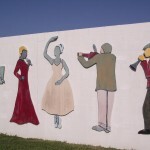 The various art projects along the length of the trail.